Balance Pom Plus is indicated by the manufacturer for the relief of menopausal discomfort. Balance Pom Plus uses a combination of pomegranate and other herbs to provide a safe, all natural way to relieve the many discomforts brought with menopause. Pomegranate– Pomegranate has shown insufficient evidence that it can help with menopausal symptoms in the studies done. Asparagus root powder- Asparagus root powder, like pomegranate, shows insufficient evidence for helping with the hormonal balance of women. Schisandra– This plant, Schisandra, has insufficient evidence showing that it can prevent premature aging. Angelica root powder- Angelica root powder, like the rest of the ingredients in Balance Pom Plus, shows insufficient evidence in proving that it can help with menstrual disorders and cramps. The recommended dosage for Balance Pom Plus is 3 to 6 capsules each day with some food and water. The price of one bottle of Balance Pom Plus is normally $27.95. However, they are now selling it for $25. 25. Each bottle of Balance Pom Plus contains 90 vegetarian capsules. The Balance Pom Plus guarantee is that if you are unhappy with the product, they will replace the product or give you a refund. You must return the product within 60 days for a refund. Balance Pom Plus does contain some beneficial ingredients, however they aren’t all clinically proven for the relief of menopausal symptoms. The recommended dose is also very high, being much higher than a comfortable dose should be. 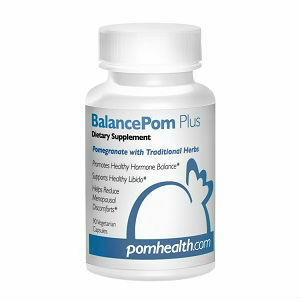 Jackie Horowitz	reviewed Balance Pom Plus	on April 27th	 and gave it a rating of 2.